It’s the Wimp meets The Voice! Our favourite dork is on reality TV recording a hit song. Big laughs, cringey moments: it sounds sweet. Do you love music, TV and Nikki Maxwell? Here’s a match made in heaven. Nikki and her friends are recording a hit song – and they’re being followed by a live TV crew. There’s only one problem: Nikki is prone to dorkness. With cameras everywhere, how will she hide her shaming secret side? 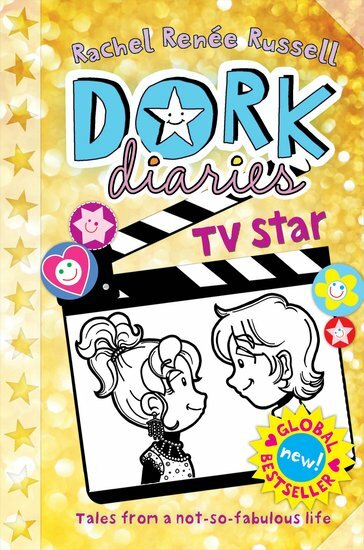 We can’t wait to get our mitts on Nikki’s latest dorky delight. She’s in the spotlight, big time. I loved this book. Best I have ever read so far. i loved it ! so cute! who doesnt want to be a tv star? Such a good book I love it when Nikki tries some snow boarding and when the chicken poxs attack the Maxwell family! I’m going to read the next one Once Upon a Dork next!